An Earthsake Exclusive - back for the holidays. 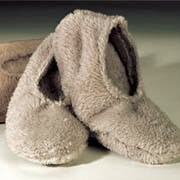 Warm Footies - Warm Booties - Toasty Toes & more! These footies have a lavender/flaxseed insert that can be heated to soothe tired feet. Pair with an Earthsake Plush Warming Body Wrap and Neck Wrap for complete and utter bliss. They heat up too! Experience Warm fuzzy footies with a warm fuzzy wrap - ahhhhhhh!